Lorraine Bubar is an artist, art educator, and a passionate advocate for the arts. She is a native of Los Angeles and received her B.A. from U.C.L.A. She studied animation at Yale University and her short independent films showed in animation festivals around the world. Lorraine worked for many years in the animation industry, animating television commercials, special effects for feature films, and feature film titles. During that time, she exhibited her watercolor paintings in numerous art exhibitions. These narrative paintings always included her animation sensibilities: the passage of time, movement, and metamorphosis. Drawing on her experience in the animation industry, she began a teaching career, first teaching animation at Santa Monica College. Following that, Lorraine taught drawing, painting, and printmaking to middle and high school students at Windward School in West Los Angeles. She is currently represented by Chemers Gallery in Tustin, CA. 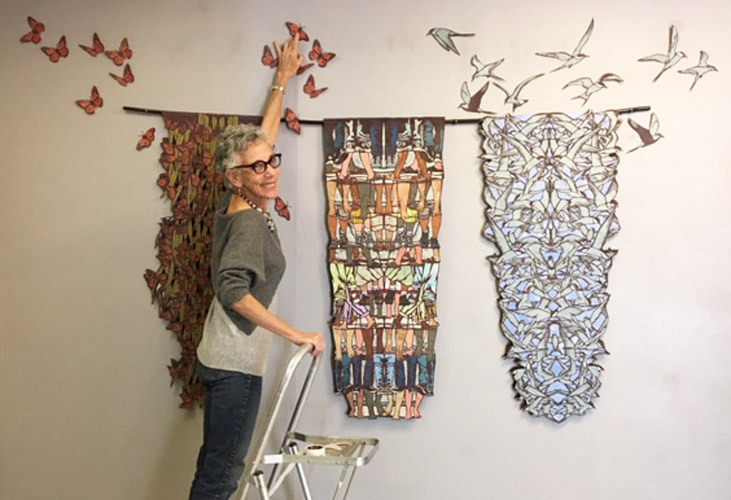 Her professional affiliations include: Los Angeles Art Association, The Guild of American Papercutters, International Association of Hand Papermakers and Paper Artists, Women Painters West, and Jewish Artist Initiative. I became interested in papercutting when I realized that so many cultures around the world, ranging from Eastern Europe and China to Mexico, utilize papercutting. As a world traveler, I have always been fascinated with what art forms or “folk art” the local people create. As a woman I have also been interested in how different cultures mark events in their family lives, from holidays to rituals. Papercuts have been created as calendars, to mark births and deaths such as for Day of the Dead, and in Judaic tradition they hung in homes and in synagogues to decorate for holidays. They were created by ordinary people working with the simplest of materials and tools. My papercutting connects me to this extensive cultural heritage, as well as actually utilizing papers created in Asian countries that I have traveled in. Papercutting as an artform that crosses the boundaries of culture, art, and craft. Lines and shapes overlap and the imagery emerges out of the texture and layering of the papers. My papercuts reflect the hierarchy of nature and the intricate layers of life. I reveal bold color contrasts and lacey textural patterns reflecting the contrast between the fragility and strength found in paper itself. My paintings are a narrative journey, reflecting my concerns about my immediate home and my environment. They are an attempt to capture conflicts, relationships, and dreams. Each painting has imagery created with transparent watercolor and colored pencil that I continually go back to in order to tell stories that are often surprising even to me. Themes that reoccur in my paintings include transformation in nature, domesticity, and coming of age. The movement and element of time is a direct response to years of working in the animation industry, besides having studied art and biology at U.C.L.A. The reflective painted surfaces remain calm, smooth, and clean, while the emotions being expressed may feel uneven and dark. My personal narratives are about our collective experiences, feelings and values that are universally explored. These mixed media drawings reflect my ever present interest in depicting the beauty and transience in nature. I have created personal spaces which play with the transparency of objects, how light plays through water and sky, and other dreamlike qualities. These drawings also demonstrate my strong interest in craft, including the use of the uneven surface of handmade paper. My inspiration can come from unexpected sources: “Next Summer” was inspired by the fortune in a fortune cookie and Waiting For Faith was inspired by a poem and performance by feminist artist Faith Wilding.